Bites and No Evidence of BB's? Two days ago I noticed some itchy bumps down by my ankles. Having just gotten back from our Northern Ontario cottage, I really didn't think anything of it. However, that night I noticed my torso was very itchy. I lifted my shirt to discover large red mosquito bite sized bites/welts on my stomach, lower back, bra-line and upper legs. They worsened the next morning into much angrier welts and became extremely itchy. Intitally my husband and I thought Bed Bugs right away. 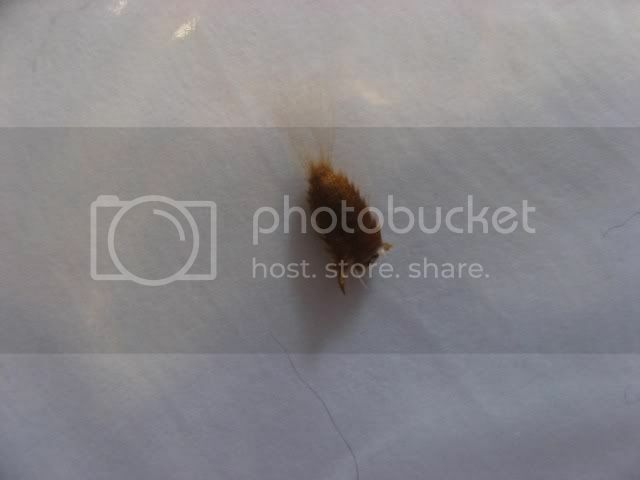 I pulled out my bedside table to discover a casing, originally thought to be a bed bug (stress!!!) 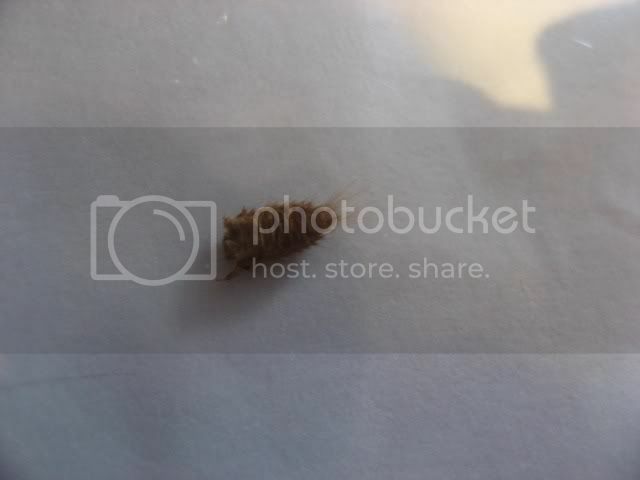 upon further inspection, however I believe it to be a carpet beetle. This is the only one I have found however. This morning my husband and I, armed with rubber gloves and flashlights upended our bed, mattress, and boxspring. We examined everthing and have seen no traces of feces, blood smears or other casings. We've called in an exterminator for the day after tomorrow to come and check out our home. We're both extreemly stressed and I am not sleeping well. Last night I took a sleeping pill to knock me out and even still I awoke every half hour (hubby and I slept in the spare room) to examine myself and the sheets with a flashlight. I'm feeling extreemly stressed and paranoid. My home doesn't feel my own anymore! So I've been reading that carpet beetles can cause reactions similar to BB's - please have a look at the bites (and be kind about my post baby belly!) and the one casing I found. I have a two year old in the house and I'm very worried about her well being and the sanity of my husband and myself! So the bug guy who we had in, who was very professional and pleasant seemed to think that the samples we showed him were bedbugs, even the one I posted that I am CERTAIN is in fact not a bedbug. We also said we're finding zero evidence, not a casting that we can see, nor droppings or blood smears. He said that early on it can be hard to find evidence, but also that can be encouraging as the infestation isn't too far gone. My hubby and I are skeptical that we do have an infestation, simply due to the lack of evidence (other than my mysterious bites of course!) I think we're going to go for the spraying anyway, simply because we don't know what else to do and we feel it'll give us peace of mind. We were told that the bugs are eliminated 70-80% of the time, so that is hopeful! Right now, my hubby and I have moved rooms and I don't appear to have any bites at the moment, and although sometimes the existing bites get itchy, I seem to be healing up. So now we're just running our washer and dryer 24-7, as we have to clean all of our clothes and linens. Good lord! I'm also planning to put our currently upside down room back together this evening. At least the house will LOOK more normal - minus the dozens of garbage bags containing our clothes, all tightly sealed up!! Will post with updates after our spraying on Wed.!